I’ve always remembered the treatments for Heart Attack as the mnemonic MONA. But I heard that the American Heart Association (AHA) has changed their recommendation and now are recommending Aspirin as the first treatment to give for Heart Attack. How does that affect MONA? However, like most things in life, more and more research has led to more and more change! Thanks to a lively debate in the comments section of this original post, I was alerted to some major changes in Myocardial Infarction (aka Heart Attack) care. As a result, here’s the explanation for the original meaning and purpose of the acronym MONA, with an added summary of the recent changes, and what this means for nursing students. 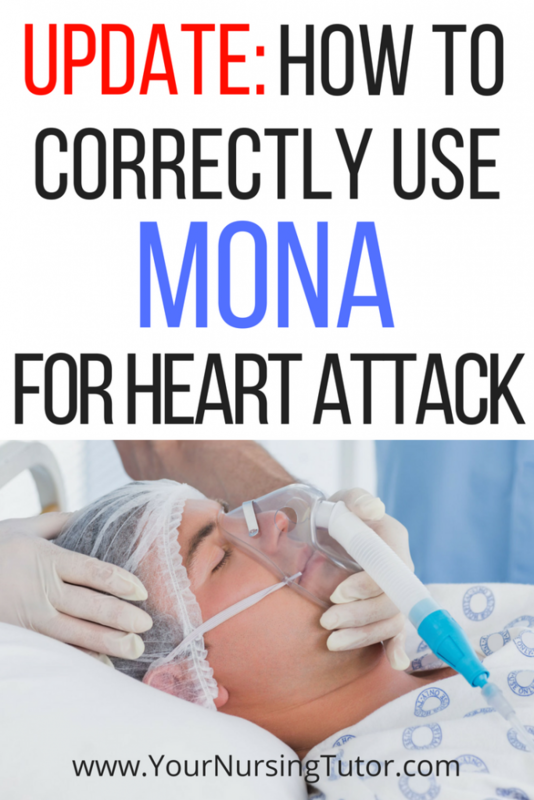 What is MONA for Heart Attack? First, for those who don’t already know, MONA is a mnemonic that stands for: Morphine, Oxygen, Nitrates, and Aspirin. These are the 4 primary interventions that used to be routinely performed when treating a patient with suspected Heart Attack/Myocardial Infarction (MI). However, what many students don’t realize is that MONA never represented the order in which you should administer these treatments as a nurse. It is a mnemonic intended to help you remember the components of MI treatment, NOT the prioritization of them. Oxygen therapy has a long history of being used for Myocardial Infarction ever since it was discovered to improve angina way back in a research study in 1900. So the Oxygen was most often given first in emergency treatment of heart attack to start increasing the amount of available oxygen in the blood. Second, nitrates would have been given to vasodilate blood vessels, which presumably allowed more room for blood to pass through the cardiac blood vessels. Then the aspirin would be given to help “thin” the blood by breaking down platelets. This helps get rid of any clots in the coronary arteries that might be contributing to the blockages causing the Myocardial Infarction. Finally, morphine might have been given to reduce pain and anxiety, which in turn was thought to help decrease oxygen demand. Morphine also slows the heart rate and has a vasodilating effect because it is a narcotic, but it was not generally given for those specific reasons. It would have been given if the nitrates did not relieve the chest pain or if the patient continued having significant anxiety. The more we learn, the more we realize that there’s still so much we don’t understand. Here’s a brief summary of all the new recommendations. There’s some mixed research findings. Some research studies have found that using morphine during a heart attack is associated with higher mortality and worse complications. Other research studies have found no change in mortality or complications. Bottom line: Don’t routinely administer morphine during myocardial infarction. However, it can still be considered an option to help manage severe pain in a heart attack patient. Routine oxygen therapy during heart attack is a long-standing tradition, however there were questions about whether this practice was beneficial, or if it caused additional problems as early as 1976. Later research studies have had mixed results, from some showing increased complications with oxygen therapy and others showing no difference in patient outcomes. These studies compared heart attack patients who were normoxemic despite their current cardiac problems…that means their oxygen saturation was normal. Bottom line: Don’t routinely administer oxygen therapy during myocardial infarction. Only consider oxygen therapy if the patient is also showing signs of hypoxemia. If the patient is normoxemic, then skip the oxygen. If a patient has a prescription for nitroglycerin manage angina, then the patient should still take nitroglycerin as directed when they have chest pain. However, if the angina doesn’t respond to nitroglycerin then the patient is generally instructed to treat it as a heart attack. That part all stays the same. The new recommendations for nitroglycerin that we’re talking is for when the patient is under direct medical care, either EMT or in the hospital. Depending on the location of the cardiac blockage, administering nitroglycerin may cause more harm than good. For example, if the blockage is in certain areas of the heart, than the nitroglycerin could expand the blood vessels so much that it causes severe hypotension, which would be problematic in its own way. In any case, the decision of when it is appropriate to use nitroglycerin is a fairly complicated and advanced topic, and I seriously doubt that you will be required to make this distinction in order to become a safe, effective, beginning nurse. Bottom line: Nitroglycerin will still be used pre-intervention IF the patient already has it prescribed for angina. But once under the care of emergency personnel, nitroglycerin should not be routinely given. Determinations about the type of heart attack will need to be made in order to determine the best course of action. Basically, the only MONA recommendation that remains unchanged is this one: take aspirin. Aspirin still helps to prevent additional clots from forming by reducing the ability of platelets to stick together, which is something that can prevent further cardiac damage. You probably heard the “aspirin comes first” recommendation because if a patient calls 911 for chest pain, they will probably be instructed to take an aspirin while waiting for the ambulance. But as soon as the EMTs arrive, they will evaluate the patient and decide the next best course of treatment. Once upon a time, I would have guaranteed that the next step would be to slap on that Oxygen mask! However, in light of recent research and the emphasis on evidence-based practice, that is likely to be changing, and has probably (hopefully!) already changed for many EMTs. Now, they are more likely to administer aspirin (if it hasn’t already been done), and assess to see if any of the other treatments (oxygen, nitroglycerin, or morphine) are even appropriate. Always look at the context of the question if you see a question like this on an exam. 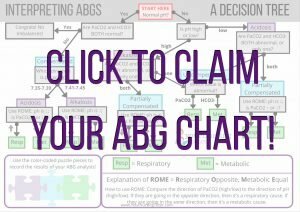 If the patient is hypoxic and in a medical setting, then you will probably still see Oxygen as an answer because of the ABC’s (Airway, Breathing, and Circulation). Hypoxia would be a circulation issue, so oxygen may be indicated in this situation. If they are in a non-medical setting, then the patient might need to take nitrates first (if the patient has them prescribed and available for angina episodes), or aspirin first if nitrates are not available and a heart attack is suspected. But if the patient is otherwise stable or has received appropriate treatment, but is still in severe pain, then Morphine may be indicated. All in all, remember that NCLEX tests if you are a safe, effective, beginning nurse. They are not going to be testing you to see if you can provide complete medical care for a complicated cardiac case using cutting edge research. That’s why understanding the principles behind MONA…both in the way it was used in the past AND in the present…will be your key to answering exam questions on this topic. As you can see, even with the new research, it’s still not one size fits all! But then again, is anything in nursing cookie cutter? Every patient is different, and needs to be treated differently. This is a perfect example of how nursing students need to use critical thinking in order to “think like a nurse”. So if you get an NCLEX style question about Myocardial Infarction, and the answer choices sound a lot like MONA…remember to assess the patient, remember MONA, consider the new research… then choose the best answer you can. It sounds like the end of all research studies… Further studies are warranted. In the meantime, guidelines internationally (US, Europe, Australasia) have advised caution with this therapy. There is abundant evidence from animal studies suggesting mechanisms of harm, and we discuss these in our updated Cochrane review. Hi! Yes you are right; aspirin slows platelet aggregation. I’m also curious as to why you make these statements? You and Matias are both incorrect to my knowledge. Paramedics by chance? I’m really thinking you’re wrong and by spreading false information, actually causing problems. They are both absolutely correct, you are absolutely incorrect. The Cochrane Library released a very large meta analysis in 2010 that showed the giving oxygen to those suffering an AMI who did not have low blood oxygen levels increased mortality by over 20%. AS a result beetween 2011 and 2012 the AHA and most other international AMI guidelines have removed the recommendation to give oxygen unless the patient has low blood oxygen levels. You, Grad student, where is your evidence that oxygen is useful in Acute Myocardial Infarctions or ACS? I LOVE when someone tells me something that is evidence based and I’ve been practicing wrong, because it gives me the opportunity to correct it before I end up in court or with a loss of license for not practicing according to the evidence. You are a bit harsh and rash in your statement without doing your research. So…. Please render your evidence. It is people like you who have kept this ritualistic routine use of oxygen going for over a century. The evidence is SUPER clear that what James is saying is SPOT on! Kudos to him for his posts. Please refer to mine (in other posts- you will see a few of them on this topic that is now a passion of mine), you will find VERY good supportive and concise studies (RCT’s and systematic reviews) that will clearly show oxygen is harmful to use in individuals who are normoxic. How is the oxygen supposed to penetrate through an occluded area exactly unless you give it hyperbolically?! Think about this logically. It is also NOT to be used in a CVA patient due to the harmful effect. It affects a person hemodynamically, the coronary vasculature, causes formation of ROS, extends MIs, increases mortality and reoccurrences, increases arrhythmias, etc… It’s overwhelming evidence!! Not just a random statement from ignorance- rather researching the evidence. You may find yourself in one of these beliefs, but it is just that- a belief! One grad student to another. I would imagine that common sense would be the guiding principle here. If arterial blood gases reveal pao2 80-100, and pulse oximetry is 95-100% on room air, why then would anyone administer oxygen? This is why assessment skills are your first line in treatment. But the question is, what is the research on oxygen toxicity? Hyper oxygenated patients are at risk for atelectasis, respiratory alkalosis, among other emergent conditions…you would think that being aware of the potential for this would be part of evidence based practice. Just a few thoughts from an L ets P lay N urse. James Im curious to know your background in HC? Just read the posts while studying for my NP and Im curious as to your EB base? As a practicing RN, my facility is also still using MONA! Thanks for the comment! 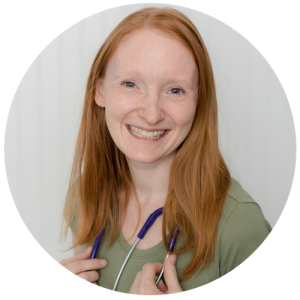 It’s starting to sound like MONA is still the commonly used method for treating clients with chest pain, even though it is not completely supported by research anymore. Very interesting! The real question is where has the data been collected and by whom? Pre-Hospital or in Hospital? It is the commonly used, but NOT evidence based. It is used out of routine and ritual verses based on sound evidence. If you are claiming this for the public to read, then you need to cite your sources please. I would LOVE to see the EVIDENCE where oxygen is of any use at all in those who are normoxic. Also, for the sake of hypoxia, it is defined as an SpO2 of 94%). But research from ICU Medicine recommends saturation be >90%, not 94%. “As most ward settings rely on pulse oximetry to measure oxygenation rather than the invasive monitoring that occurs in critical care areas, the BTS (British Thoracic Society) recombines a “normal” target saturation of 94-98%. This allows a margin of safety (90-94%) for possible inaccuracies in pulse oximetry readings and a ‘safety cushion’ to allow for fluctuation in the oxygen saturation”. If you are ABG’s that show that the SaO2 is matching with the SpO2, you can easily use 90% as your limit. People who are having an MI are generally NOT hypoxic. How is oxygen that you put on someone’s nose supposed to reach the occluded part of a person’s heart. Think about it. There is no need for normoxic patients to get oxygen at ALL unless they have carbon monoxide poisoning. It is simply creating damage. Please don’t teach people wrong information. We have been using oxygen for over a century now, even though the last half of a century evidence is proving harmful to the cardiovascular system. It is WELL documented. The AVOID trial, 638 were randomized for the trial, 441 were confirmed as a STEMI. The primary endpoint for the AVOID trial was size myocardial infarction, cardiac biomarkers. There was a highly significant CK level increase of 25% (mean peak and area under the curve), with p value 0.01, indicating increased myocardial injury in those who receiving oxygen. The troponin was not significant difference- confidence interval levels were too high. Similarly, a secondary confirmation that oxygen increase cardiac injury, came with the secondary end point. Six months after the trial, all patients were offered the choice of having an CMRI, the gold standard for depicting cardiac damage. One-third (139 patients) of the patients returned and there was a 30% light gadolinium enhancement, in the oxygen control group. All of these findings suggest that oxygen should be AVOIDED for those who are normoxic in those having an acute myocardial infarction. "High oxygen levels promote the formation of reactive oxygen species, increase angiotensin I, and decrease adenosine levels. These consequences, as well as the possible direct effects of high oxygen, can alter the coronary vasculature and influence haemodynamic parameters. Further, reactive oxygen species can augment the harmful effects of oxygen by promoting arrhythmia and tissue injury." (see site below, it even has a picture). Did you do any research on this relating to the feedback that Matias and Dr N gave you? I am a third year nursing student looking for a topic for my thesis and if what Matias says is true, this could be a fantastic topic. I will do some research now but let me know if you found anything if you don’t mind. I’ve only done a very minimal review, but apparently in 2010 the Emergency Cardiac Care Guidelines changed to emphasize the use of Nitroglycerin and Aspirin first, and Oxygen only if sats are below 95%. Morphine was supposedly associated with increased morbidity as Matias said, but I haven’t read the original article to see what those statistics were. Please let me know if you choose this topic and what you find out! Matias is incorrect. 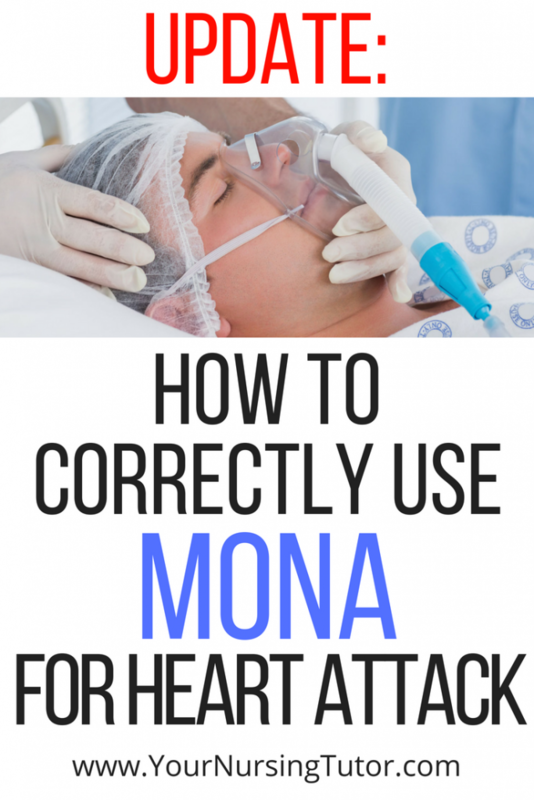 MONA is still the approved, evidence-based emergency-dept. treatment protocol for non-STEMI ACS. We use it in our ER, and we are an accredited chest pain center. Oxygen “rests” the heart, and during an acute condition, O2 is absolutely NOT harmful, and will reduce pain during an ischemic episode. Matias doesn’t know of any “studies” because he is apparently NOT in the field, otherwise he would know this is solid, evidence-based practice. Look up ENA’s position on this. – RN in level I trauma center. Wow, RN, that’s some scary stuff. – “O2 is absolutely NOT harmful, and will reduce pain during an ischemic episode” – nope and nope. It CAN be harmful, in fact, there are many studies showing the hyperoxemia induced by supplemental O2 causes worse outcomes. It has absolutely no effect in reducing pain because it won’t correct the ischemia — blood isn’t properly reaching the ischemic area, so it doesn’t matter how much oxygen the blood has in it. I am an AG-ACNP student who is doing extensive studies on this matter as well. I am in total accord with James. We are missing the evidence. Cochrane did a full systematic review on this. There are multiple studies that, we as medical personnel, are doing strictly based out of ritual and routine without true convincing evidence. Here are some straight up sources for those who THINK that oxygen is okay to give to ANYONE, especially acute myocardial infarction or ACS patients who ARE normoxic (normal SpO2 that is defined as >/= 90%). It is detrimental and we need to STOP! Studies are showing a five fold increase in recurrent MI’s due to oxygen use, increased reperfusion arrhythmias, increase in reoccurrence and MORE, all of this leads to increase in cost and mortality. I could write more and more but I am actually writing a paper on this right now. Look at the AVOID study. And, soon (Dec 2015) look at the DETO2x-MI. Below is OVERWHELMING references for you all to look at incase you are doubting what James is saying in his posts. Look at the evidence yourselves. DETO2X- AMI study (2013). Retrieved from http://deto2x.se/wp-content/uploads/2013/04/DETO2X-AMI-pilot-study-poster-vårmöte-april-2013-slutversion.pdf (when you open this one, it is very colorful, but it is about the trial. Results of this trial will not be revealed about mortality, etc… until Dec 2015). Be Nice. Nurses have a reputation for eating their young. Don’t perpetuate. This post is misleading. The AHA no longer recommends morphine, or oxygen unless indicated. Morphine has been shown to increase mortality, probably by masking symptoms of ongoing ischemia, and should be reserved for select patients. Over-oxygenation can also be harmful, and should be reserved for patients with O2 sats below 94%, or 90% (depending on the source you look at). If paramedics “just slap on that Oxygen mask” without checking O2 sats and titrating accordingly, they are doing the patient a disservice. Additionally no studies that I know of have shown a benefit to O2 in ACS. As long as it is used judiciously, however, it probably can’t hurt. Thanks for the feedback, I will have to look into that further and see what their new recommendations are. As always, we would want to assess each patient based on their individual needs before deciding what care to give. But in order to be considered a safe, effective, beginning nurse for nursing school or NCLEX purposes (aka testing purposes! ), MONA recommendations have traditionally been the way to go. I would like to correct your correction. As reguards to O2. O2 in the prehospital setting is well, like fish to water. The “HARM” that O2 toxicity and depriving a pt of their hypoxic drive is very unlikely and limited by their time on a 100% NRB. If the pt loses their hypoxic drive the EMTS/Pararmedics can simply remove the mask and breath for them (thats the primary skill for EMS). Most studies that claim “Over oxegenation” causes harm are studies based in the ER/ICU when a very busy nurse forgets to turn down the flow rate or pull off the NRB valves. I am a current Paramedic Student and just talked to the Medical Director of the county my school is in. He explained that 60min. Oh and yes we “slap O2” on almost all pts without doing a blood gas draw. If they needed the [email protected] they can now say/indicate thank you, if they didn’t need it you get a “what are you doing”? and we can simply take it off. Most people who call 911 want help and mearly giving them O2 will help to calm them down (pacibo effect). Some how my post is missing portions. addendum; 100% O2 via Nonrebreather Mask for 60min has been documented in the clinical/hospital setting to cause harm. EMTs/Paramedics are trained (Hopefully) to breath on behave of someone who cannot. So if we need to take over for them, we will.